Upon noticing this image, at first glance you probably think, “nothing to see here.” Just a regular grey apartment block without even the benefit of decoration or a fancy color to make it stand out. But look again and you'll notice something isn’t quite right… Care to catch some sun on the balcony? Or how about stepping outside for a second? 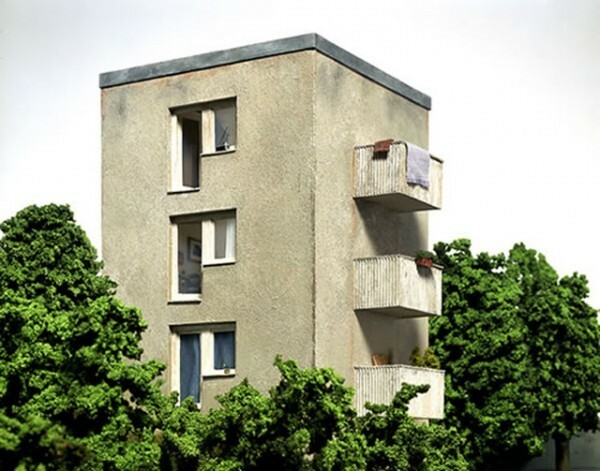 Like many of the models by German artist and photographer Frank Kunert in his "Small Worlds" series, the surreal aspect of this building isn't obvious to the casual observer. However, once you perceive the absurdity at play, it’s likely to bring a smile to your face. Humor is an important element in all Kunert's miniatures. Humor and more than a touch of the surreal – giving our powers of perception a workout; this is satire on a small but no less captivating scale.